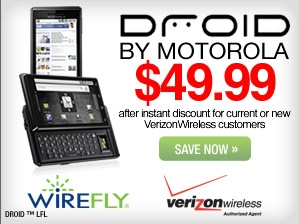 and the price just keeps on droppin’ for the motorola droid. well, through wirefly that is. if you sign up for a new contract with verizon wireless or just use your 2-year contract update, you can now get a droid for $49.99. amazing. city caller id app - sued by cequint?